Are you at a crossroads? Have things come to a head recently and there are a few choices of which direction you should take? Is an investment paying off and taking you to a new level, but leaving you restless instead of content? The Seven of Pentacles is the card that shows up in the Tarot readings of those pondering a change in their life’s direction. A man stands at his vineyard with his hands folded on the tip of the pole of his spade. He is resting his body weight on his hands on the tool with its blade head set deep in the tilled soil at his feet. There are seven gold Pentacles sprouting from the vines before him. The sky above is gray and the landscape behind him stretches empty for miles. 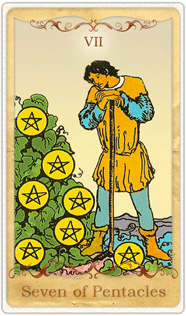 In the Tarot, the suit of Pentacles represents material wealth. There are three ways to create wealth: one can manufacture it, mine it, or grow it out of the ground. The Seven of Pentacles represents the moment where one realizes that tangible success has arrived, and yet, after all your hard work, there is a moment where you pause and wonder what is to be done now. Resting on the tool is finding a new use for the thing that brought you to this point. Illustrating the man in this pose presents you with the option to find new ways of using your own tools to continue toward success. After all, the path you take is one that you can choose; you have earned that right. 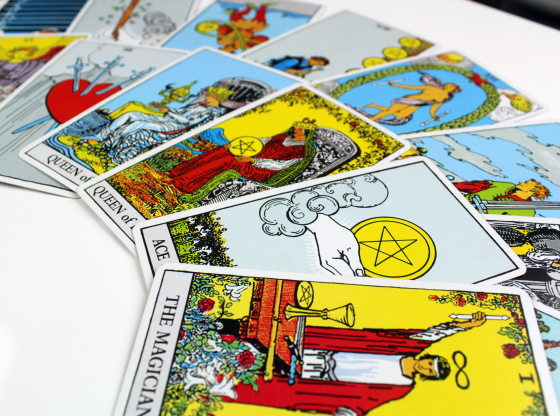 The Tarot reading sees cards dealt out into positions of past, present and future. 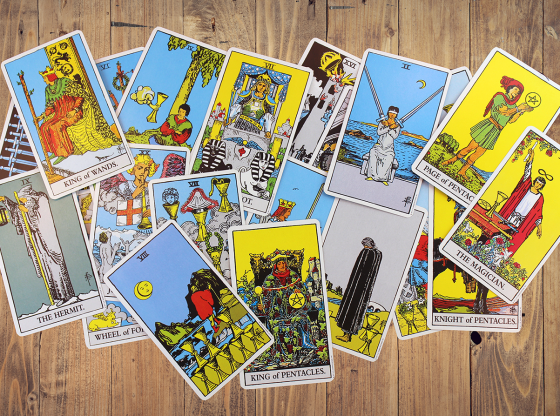 The meaning of a particular card changes depending on where it lands in the spread of cards. When the Seven of Pentacles is dealt in the past position, you are reminded that your current situation is one that you had time in which to consider your options. You arrived to where you are now because of one person: you. Often this is a great feeling, to know that you made a good choice. However, if you are currently in a negative state of mind, the presence of this card in the past position may be confronting you with the fact that you created many of the circumstances from which you now suffer. 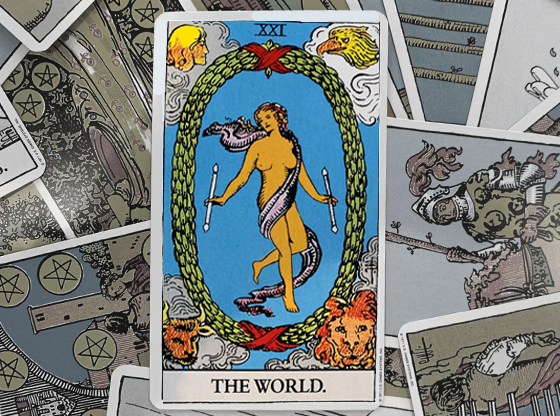 In the present position, this card represents your free will and opportunity like few other cards in the deck. 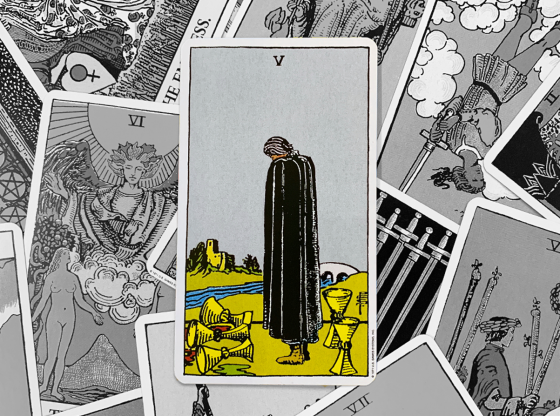 The Tarot is letting you know that you can take a little time to see where you can go from here. This is a card that acknowledges you have reached a new level but insists that it is up to you as to whether you will stay on this plateau or move upward for greater success. 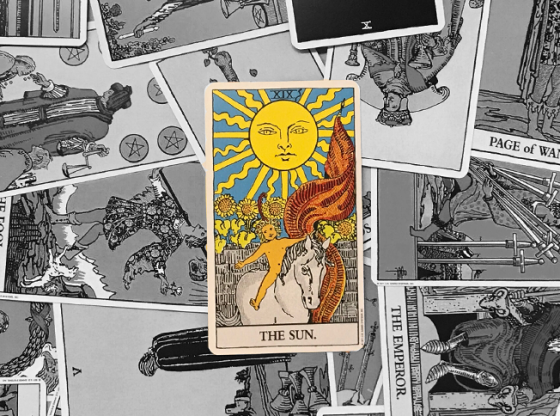 When the Seven of Pentacles appears in the future position, the Tarot deck is predicting that you will see success in your future; however, this success is not going to be handed to you. If you are currently involved in a venture of diligence or hard work, this card in the future position is a big blessing, but it is not a guarantee. While something on which you are working or to which you are committed will most certainly bear fruit, you possess free will. At the moment in the future that you realize things are occurring as you had planned, it will be up to you to embrace the success that you currently can only dream about. It is shocking how many people are afraid of success and the changes that it brings. Will you be ready to take the fruits of your labor to market when the moment of harvesting your talent arrives? 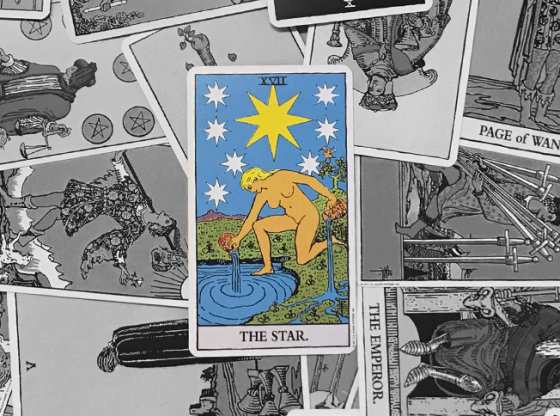 When your Tarot reading has begun, the cards laid out combine energies and flavor each other, adding subtle meanings to the core components of each card. 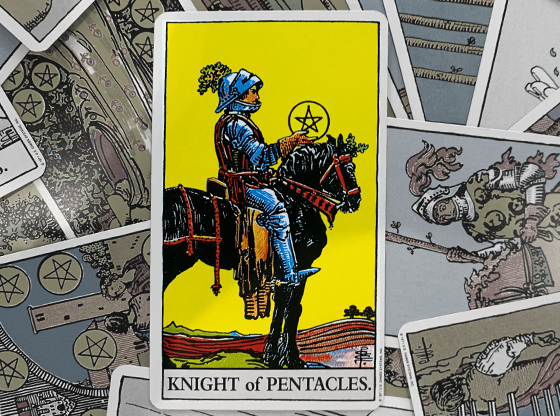 The Seven of Pentacles has a deep relationship to the two cards in the Major Arcana that carry the number seven: The Chariot and The Star (numbered seven and seventeen, respectively). When either of these cards appears in your reading along with the Seven of Pentacles, the rewards you are about to reap will be multiplied. The Chariot delivers a public success and The Star a private satisfaction. There are other cards in the Tarot that refer to a pause to relish what is about to come. The Three of Wands appearing in a reading with the Seven of Pentacles indicates that your personal touch will be the thing that aids your success. 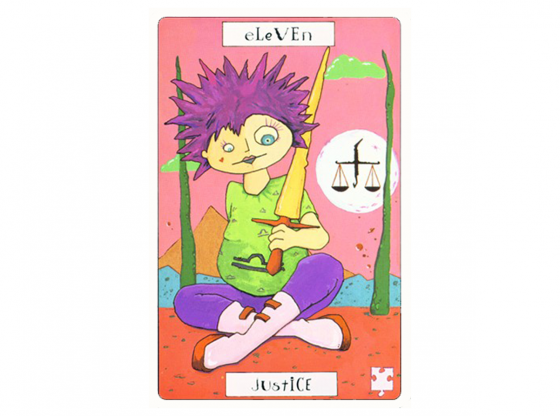 Judgment adds to the immediacy of the moment, urging you to get all you can out of your efforts. The Five of Swords underscores that others are to thank for some of what you have accomplished, but whether or not they are around to enjoy this success remains to be seen. Other Minor Arcana cards numbered seven appearing in your reading with this card will add to the realization that you have something special. With the Seven of Cups, there is a dreamy state of wondering just how great your goals might be. Be careful not to indulge illusion without a balanced view of realistic possibilities. The Seven of Swords makes the current success something that others might try to take credit for, or you may find others insisting that you somehow owe part of your coming success to them. The Seven of Wands appearing in your reading brings the possibility of an uphill battle to let the world know about your recent prosperity. 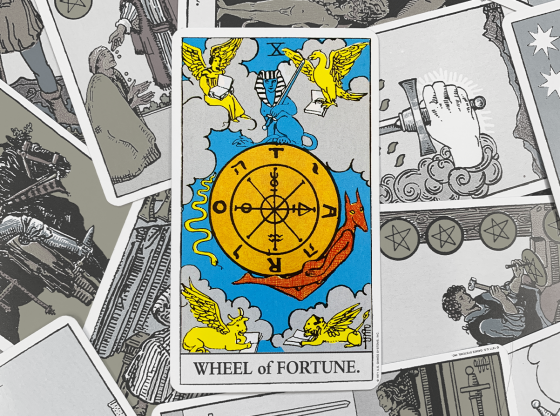 When The Wheel of Fortune appears alongside the Seven of Pentacles, you will enjoy your moment of success proportionate to how long you have been on the bottom. If you did not truly earn what is coming your way, you might not hold on to your coming rewards all that long. 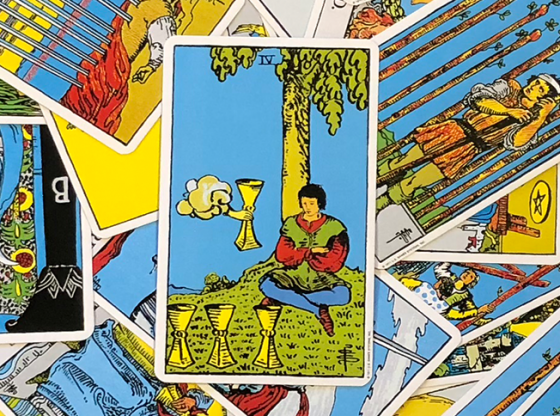 Some Tarot scholars have looked at the resemblance of the shovel’s handle in the Seven of Pentacles and straight stick carrying the knapsack of the character illustrated on The Fool card. The thought is that the man in the Seven of Pentacles will make his fortune, buy some fancy clothes and pursue a retirement of wandering in search of pleasure. If you get this combination in your reading, happy trails, you have earned the good life.